ELV update: Now they’re telling us it will open Wednesday, September 7th. Why is this Frenchman (and the Frenchmen below) smiling? Because Central (sen-TRAL) is set to open this Tuesday in Caesars Palace — right smack next to the front valet and check-in desks — making it overnight the busiest three-meal-a-day restaurant in town. Correction: It will be the busiest 24-hour-a-day restaurant in town. The plan is for Central never to close, making it the go-to spot for those seeking quality late night bites…instead of the Peppermill/Denny’s-grade food most late night revelers are stuck with. Hmmm…a chef-driven restaurant that never closes? A first for Las Vegas (or anywhere) to be sure, and one that will be fascinating to watch…and sample…at all hours of the day. 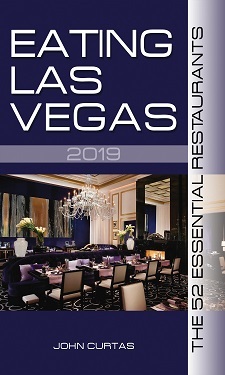 Corporate Executive Chef David Deshaies tells Eating Las Vegas the menu will be substantially similar to the James Beard Award-winning fare of the original Central in Washington (D. C., not Kansas), with a menu expansion of perhaps 20-30% to accommodate the international tastes of the Vegas tourist market. Michel Richard’s steak frites, cheeseburger, fried chicken, rotisserie chicken and desserts are already legendary, so we’re guessing things are about to get even tastier around Caesars Palace….and al fresco dining — something long and inexplicably ignored by Vegas hotels — is about to get another delicious shot in the arm.